Mix 1 to 2 scoops of BEYOND WHEY RECOVERY once daily (or as required to meet youur daily protein requirements) with 8 to 16 oz cold water (8oz of water to each scoop) immediately before consuming and blend with a spoon or use a shaker bottle. Consume within 90 minutes following exercise. Before using this or any other product, seek advice from a healthcare practitioner. This product is intended for use as a food supplement only, do not use of weight reduction. Before, during and after training be sure that you drink lots of water to avoid dehydration. To be consumed by healthy adults 18-50 years of age. Do not exceed recommended serving. This product contains derivatives obtained for milk. 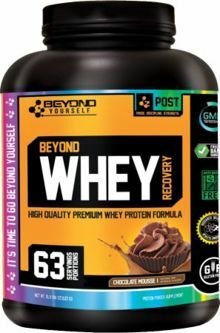 Beyond Yourself’s BEYOND WHEY RECOVERY contains 23 grams of highly bio-available hormone/anti-biotic free whey protein, perfect for anyone looking to help add lean muscle, maintain valuable gains and/or activate thier metabolism. BEYOND WHEY RECOVERY is rich in both naturally and added amino acids, most importantly BCAAs (6.5g per scoop) and Glutamine (4.8g per scoop) making it a great option for muscle volume and recovery. Sweetened with Stevia leaf, an all natural and side effect-free sweetener, you get a great tasting protein without calories or impact on blood sugar levels. WIth 6 incredibly delicious flavors and , one taste and you’ll think your post workout shake is more like a cheat meal than a protein shake. Go ahead It’s time to go BEYOND YOURSELF!